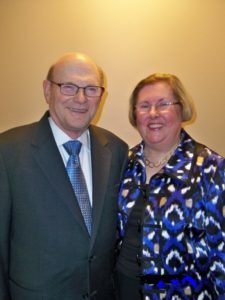 George and Myra Gordon exemplify the spirit of philanthropy through their involvement in, and support of, numerous community organizations during the more than 45 years they have lived in Normal. Myra helped to found Operation Recycle (the precursor to today’s Ecology Action Center), serving as its Executive Director when it became the full-time recycling center for McLean County, and is currently a “board member in perpetuity.” She was Co-President of the McLean County League of Women Voters, board member of the Multicultural Leadership Program and member of the Bloomington/Normal-Asahikawa Sister Cities Committee. A past member and Vice President of the Illinois Prairie Community Foundation board, Myra volunteered to serve as interim Executive Director in 2007. She was named permanent Executive Director in 2008 and served in that role for more than six years. Achievements during her tenure include the Women to Women Giving Circle, Youth Engaged in Philanthropy and increasing IPCF grants from $12,000 a year to more than $200,000 annually. George is a retired Professor of Politics and Government at Illinois State University, where he taught for 38 years. He has been a member of the McLean County Board for 20 years, chairing its Land Use & Development Committee for 16 years, and currently chairs its Justice Committee. He also has served with Cedar Ridge Elementary School Promise Council, the Unit 5 Diversity Advisory Committee, the Board of Compassion and Choices, and Moses Montefiore Temple, where he is a Past President and has served as Choir Director for more than 30 years. Believing in the power of endowments to create a secure future for Central Illinois, the Gordons have created two endowment funds: the George J. Gordon Scholarship in U.S. Public Affairs at ISU and the Gordon Performing Arts Fund at IPCF, which provides annual gifts to Heartland Theatre and the Illinois Symphony Orchestra. 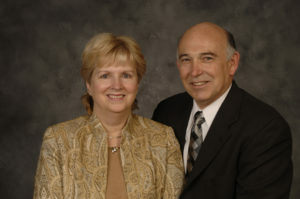 Darrell and Donna Hartweg have been active in many organizations since moving to Bloomington in 1968. Darrell served on St. John’s Lutheran Church’s Charitable Trust board for 25 years, including six years as its chair. Other leadership positions include the University of Illinois YMCA Board of Trustees where he was chair for 13 years, Illinois Prairie Community Foundation, where he served on the board for nine years including four as its president, and the Community Cancer Center’s Board of Governors since 2009, serving as its president from 2013 to 2015. He is a member of IPCF’s development committee and the Downtown Bloomington Association. Darrell is a partner at Hartweg, Turner, Wood & DeVary Law Firm in Bloomington. A long-time member of the McLean County Bar Association, he received the Association’s Lincoln Award of Excellence in 1999. Donna is a Professor Emerita of Illinois Wesleyan University where she served as Director of the School of Nursing from 1990 to 2009. She was appointed by the governor in 2006 to the Illinois Center for Nursing Advisory Council that recommends policy on nursing workforce resources. Donna has been president of several boards including BroMenn Hospitals Board (now Advocate), Community Health Care Clinic, Illinois Association of Colleges of Nursing and the regional Illinois Nurses’ Association. She is currently vice chair and head of strategic planning for the John M. Scott Healthcare Commission. In addition she reviews grants for several organizations including the Women to Women Giving Circle at IPCF where she is a founding member. Recipients of the Hartwegs’ philanthropy include Community Health Care Clinic, Community Cancer Center, Illinois Wesleyan University School of Nursing and Donna L. Hartweg Endowed Leadership Award, Theta Pi Chapter of Sigma Theta Tau International Honor Society of Nursing at IWU, Lamu Center for Preventative Health in Lamu, Kenya, University of Illinois YMCA, St. John’s Lutheran Church and Illinois Prairie Community Foundation. John and Marilyn have a long history of service and generosity to the community. Both have held leadership positions in the Illinois Symphony Orchestra and its Guild. John's board service includes Boys and Girls Club Advisory Council (Co-Chair of its fundraising drive for two years), Advocate BroMenn Governing Council, Community Cancer Center Nominating Committee, McLean County Compact, Prairie State Legal Services Campaign Committee (Co-Chair of its fundraising drive for three years), and Salvation Army (Life Member). He serves on IPCF's Arts and Culture Grants Committee. Marilyn is a Founding Member of the Women to Women Giving Circle and serves on IPCF's Shulman Grants Committee. She volunteers at the Loaves and Fishes Soup Kitchen, the Normal Theater, Crossroads Global Handcrafts, and local public schools. She is a Master Naturalist with the University of Illinois Extension program and serves on its Advisory Council. The Freeses donate generously to many organizations including Advocate BroMenn, Community Cancer Center, Illinois Symphony Orchestra, McLean County Museum of History, WGLT, and the Illinois State University Foundation where, among other gifts, they established an endowed scholarship. 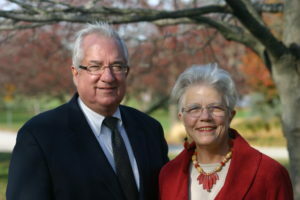 John and Jan have held key leadership positions with Illinois Symphony Orchestra and its Guild, including John's service as President of the Symphony. They have supported American Red Cross' Evening of Stars since its inception 20 years ago, serving as co-chairs of the event in 2004. Jan is a Founding Member of the Women to Women Giving Circle at Illinois Prairie Community Foundation. John is a Founding and Charter member and past President of Bloomington-Normal Sunrise Rotary Club, has been active in McLean County Chamber of Commerce, and has served as the Director of Organizational Development for Boys and Girls Club of Bloomington-Normal. 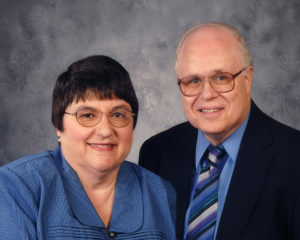 Other organizations impacted by the Wohlwends' philanthropy include Advocate BroMenn Medical Center, Boy Scouts of America, Girl Scouts of Central Illinois, Illinois Heart and Lung Foundation, St. Jude Children's Research Hospital, Court Appointed Special Advocates (CASA) Association, Pratt Music Foundation, the McLean County March of Dimes, the Children's Discovery Museum and many others. Since moving to Bloomington-Normal in 1988, Bob an Julie have been actively involved in leadership in a variety of local organizations and have positively impacted the community. Julie is a Founding Member of the Women to Women Giving Circle at Illinois Prairie Community Foundation and served as board Chairwoman of United Way of McLean County. The couple served as honorary Chairmen of The Baby Fold's 2013 Festival of Trees and both have served as President of McLean County Chamber of Commerce. Other organizations with which they have been involved include American Red Cross of the Heartland Evening of Stars, Illinois State University Board of Trustees, ISU Athletics, ISU Red Hot Society, Bloomington-Normal Economic Development Council, W.D. Boyce Council Boy Scouts of America, Sunrise Rotary Club, Illinois Symphony Orchestra, Central Catholic High School, and Holy Trinity Catholic Church. 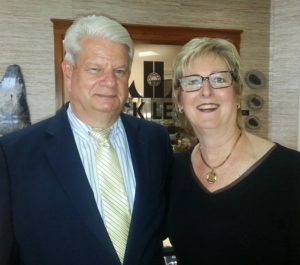 Roger and Mary have established wonderful traditions of giving to our community since their arrival in 2001 and have been involved and supported many community organizations. Mary is an active Founding Member of the Women to Women Giving Circle at Illinois Prairie Community Foundation. The couple has served as Chairmen of American Red Cross of the Heartland Evening of Stars. Roger is a past board Chair of Illinois Symphony Orchestra and chaired the Symphony's Music Director Search Committee. 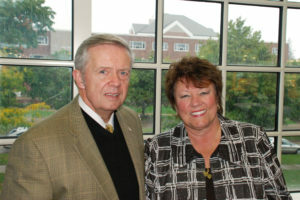 Other organizations that have benefited from the couple's leadership and philanthropy include Advocate BroMenn Medical Center, Bloomington Kiwanis Club, Illinois State University Community Partners, Mennonite College of Nursing, the McLean County Chamber of Commerce, and the United Way of McLean County. Deanna and Alan have given many years of service and philanthropy to a wide range of organizations throughout our community. Deanna's involvements include Leadership McLean County, United Way of McLean County, McLean County Chamber of Commerce, Community Health Care Clinic, Multicultural Leadership Program, The Baby Fold, Humane Society of Central Illinois and Illinois Prairie Community Foundation. She is a Founding Member of the Women to Women Giving Circle at Illinois Prairie Community Foundation and served on its Steering Committee. Alan has served the local Cornbelt AMBUCS organization for over 20 years. He is a past Vice President of the Occupational Development Center and past board Chair of LifeCil. He volunteers at Midwest Food Bank. The couple has served as Chairmen of Red Cross Evening of Stars and Miller Park Zoo Do fund raisers. 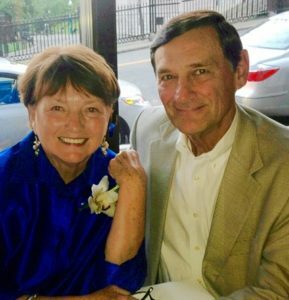 Jerry and Carole have the distinction of being the First Philanthropists of the Year to be honored at the annual Celebrating Local Philanthropy Luncheon in November. The Ringers are life-long philanthropists whose generosity of time, treasure, skill, and enthusiasm touch our community, our state, and our world. 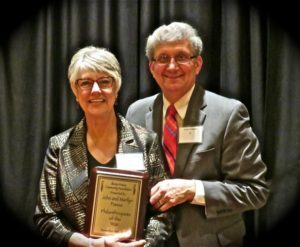 Carole served as the first Executive Director of the Community Foundation of McLean County (the former name of Illinois Prairie Community Foundation). While serving in that role, she was instrumental in applying for and receiving National Standards (national accreditation from the Council on Foundations). Carole remains active at Illinois Prairie Community Foundation as a Founding Member of the Women to Women Giving Circle and member of its Steering Committee and as a member of the Investment Committee. She has served as board Chair of Illinois Symphony Orchestra and Friends of the Arts at Illinois State University. Jerry has served as board Chair of Illinois Shakespeare Festival Society and Senior Professionals at Illinois State University. He serves on the Development Committee at Illinois Prairie Community Foundation. Jerry served nine three-year terms on Cornell College's (Iowa) board, including one as its President, and was honored by the college for a lifetime of service and giving. A retired ophthalmologist, Jerry has donated his medical services on several trips to Africa.